The “Sister Libraries”-Connection between Pozega in Serbia and Westoverledingen in Germany exists since January 2010. The first idea to do something together was the “Treasure Chest”-Project with Mini-Books. A Treasure Chest full of self-made Mini-Books was the central object of this project. And the children were very motivated to fill the Treasure Chest with their Mini-books full of own stories, pictures and ideas. The Treasure Chest is a symbol for the value of books, reading and fantasy – but not the main and only aspect in the project. More important is the change of books and ideas between the libraries in Germany and Serbia and the knowledge about the life in both countries. So in both libraries, the children not only created Mini-Books to put them in the big box. They also wanted to exchange them. Some books went by post from Germany to Serbia and some of them from Serbia to Germany. In Westoverledingen, the Mini-Books of both countries are presented with a small exhibition in the town hall. The children, who created the books in Germany, are very young, most of them 6 or 7 years old. Also some parents helped them to write the stories or to draw the pictures, so the project is also a “family case”. More than 100 Mini-Books were in the treasure chest at the end and some of them are in Serbia now. Some younger children were interested in the project. They listened to an Serbian traditional fairy tale about a prince and a princess, they painted pictures with princes and princesses and they played the story in their own way. At the end, the princess should visit a foreign country – like the princess in the fairy tale too – and so, the pictures of prince and princess also made a journey: to Pozega in Serbia!! Certainly they also looked for “Pozega” on a map and had a lot of questions about Serbia! 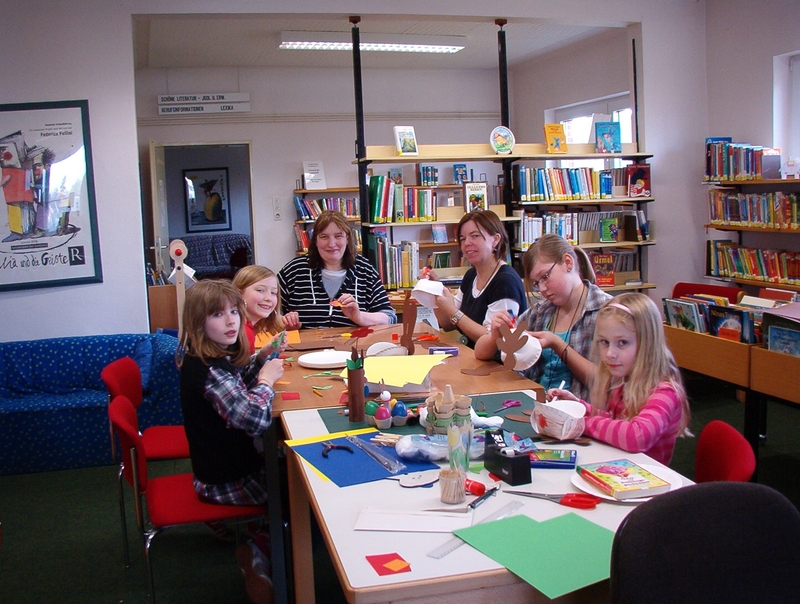 Children in the library of Westoverledingen, creating their own ideas with paper. 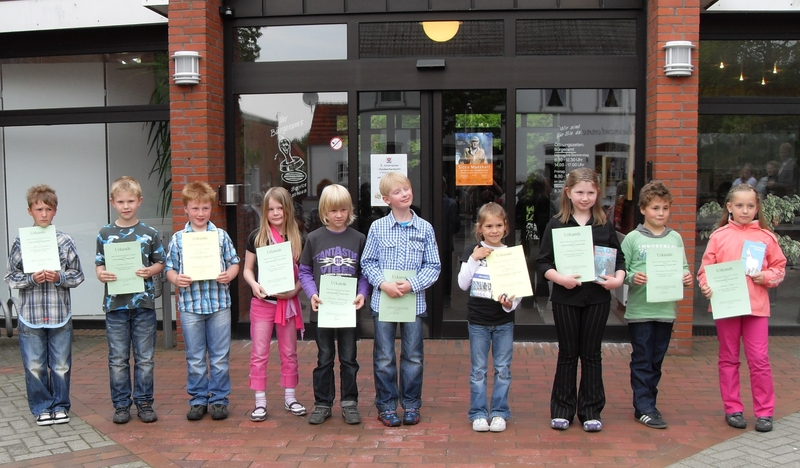 Children, 7 and 8 years old, after the reading action 2010 in connection with the opening of the treasure chest in the town hall of Westoverledingen. der weiß: Man braucht viel Holz dafür. Aus vielen Bäumen wird Papier. Die Säge brummt. Der Baum fällt um. Der Hase meint: Das wäre dumm! in denen viele Tiere wohnen. Die Bäume müssen wir verschonen! für Zeitung, Hefte, tausend Blätter. Und wir –wir werden Bäume-Retter! Willst du nun wissen, wie das geht? Schau nach, was in den Büchern steht! The „Sister Libraries” Project is a very nice and uncomplicated way of getting contact, although there are long distances and maybe some difficulties with the foreign languages between. The colleagues of both countries have the possibility to bring their different talents and ideas in this project. So, for example, the web presentations of Daniela Skokovic about all the activities for the project are great! The photo documentations of Serbia are really a colourful contribution to the project. The children in Germany are very interested to see all the pictures at the monitor. The first step in participating in IFLA Sister libraries project is easy. All you have to do is to fill the application form, make contact with a librarian from your chosen library and then start the magic for your children. Exchanging ideas, projects and plans is an interesting and exciting journey for you and your users. Our first joint action we named “Treasure chest“. Our children enjoyed in creating handmade small books full of messages about themselves, our city and country. We have two groups of children in this activity – those who learn German as a foreign language in school helped the younger ones to write and to learn their first words in German. 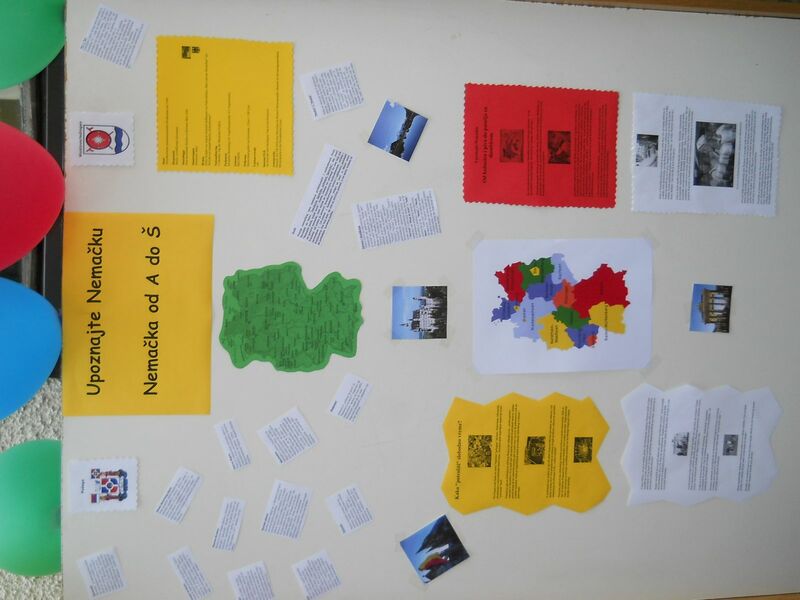 We also prepared the exhibition “Germany from A to Z“ with some interesting facts and photos. Connecting children with our new German friends is an excellent way to teach them values of friendship, tolerance and other cultures. “Treasure chest“ is the first joint action of our two sister libraries but that is also a symbol of our future cooperation – we opened our minds and hearts for more jewelry thanks to IFLA Sister libraries project. Le premier pas pour participer au projet IFLA Sister Libraries est bien facile : tout ce que vous devez faire est de remplir le formulaire d’inscription, contacter le bibliothécaire que vous aurez choisi, et la magie commence pour vos enfants. Echanger des idées, des projets et des plans est un voyage exaltant pour vous et pour vos usagers. Nous avons appelé notre première action conjointe « Le coffre à trésors ». Les enfants se sont amusés en créant avec leurs mains des mini-livres pleins de messages sur eux-mêmes, notre ville et notre pays. Nous avons deux groupes d’enfants pour cette activité : ceux qui apprennent l’allemand comme langue étrangère à l’école ont aidé les plus jeunes à écrire et à apprendre leurs premiers mots en allemand. Nous avons aussi préparé l’exposition « Allemagne de A à Z », avec des informations intéressantes et des photos. De mettre nos enfants en rapport avec nos nouveaux amis allemands est une excellente manière de leur apprendre l’amitié, la tolérance, et d’autres cultures. « Le coffre à trésors » est la première action conjointe de nos deux bibliothèques partenaires, mais elle est aussi le symbole de notre future coopération : nous avons ouvert nos esprits et nos cœurs à davantage de trésors, grâce au projet IFLA « Sister libraries ». This is open to all libraries that are paired up in the programme. To share your updates on the blog. Do email Ian Yap at ian_yap@nlb.gov.sg (The Blog Editor). Thank you for contributing to the cause. Ce blog est ouvert à toutes les bibliothèques inscrites au projet. Pour partager vos expériences, poser des questions, etc., envoyez vos textes à ian_yap@nlb.gov.sg. Merci! For me, dialogue and exchanges with Mtein library are really enriching and exciting. I am fascinated, at each of Maha’s e-mails, at all that is done, without a big budget, at this small library, and that makes me want to do more things myself. The list of Arab books that Maha gave me was very useful for us to know which titles are the best and which are preferred by children. This has enabled us to enlarge our offer, since we (Paris library network) order all books in Arabic at the same distributors, and we have a tendency to order all the same titles. On the other hand, I would like to help Mtein library more, sending them books or supporting their projects, but we are often blocked by complex technical, financial and administrative constraints, and it is a pity. We have realized that maybe it is better to focus on just one big project, plan it long in advance (one or two years) so as to organize all and find partners. At any rate, “Sister Libraries” is an excellent way to open up to the world, to meet fascinating people, to get out of routine and discover other ways of exercising our profession, and I recommend colleagues to take part in this adventure. Pour ma part, l’expérience de dialogues et d’échanges avec la bibliothèque de Mtein est toute à fait enrichissante et passionnante. A chaque mail de Maha, je suis émerveillée de tout ce qui est fait, sans beaucoup de moyens, dans cette petite bibliothèque, et cela me donne l’envie et l’impulsion pour en faire plus de mon côté. La liste de livres arabes que m’a donnée Maha nous a été très utile pour savoir quels sont les meilleurs titres et ceux qui marchent bien auprès des enfants. Cela permet d’élargir notre offre car nous (les bibliothèques de notre réseau de la ville de Paris ) commandons tous les livres en arabe chez les mêmes diffuseurs et nous avons tendance à acheter tous les mêmes titres. Par contre je souhaiterais pouvoir plus les aider en leur envoyant des livres ou en les soutenant dans leurs projets mais là on est souvent bloqué par des contraintes techniques, financières et administratives complexes, et c’est bien dommage. Nous nous sommes rendu compte qu’il valait peut-être mieux se focaliser sur un seul gros projet, le prévoir à long terme (un à deux ans à l’avance) pour pouvoir tout organiser et prévoir des partenariats. En tout cas, les « Sister librairies » sont une excellente façon de s’ouvrir au monde, de rencontrer des gens passionnants, de sortir de nos habitudes et de découvrir d’autres façons d’exercer notre métier et j’engage d’autres collègues à se lancer dans cette belle aventure. We registered for the Sister Libraries project, launched in November 2009, to develop our library and promote reading in our country. Cooperation between our small library and one of Paris public libraries can be an asset for us and our young readers. We have exchanged e-mails describing the activities of both libraries, after describing our working places: majestic for Chaptal (the “hôtel de Sérigny”, built in 1780, entirely renovated), pretty modest for Mtein. The idea of being «　sister　» to Chaptal has appealed very much to me , since there are not, at first sight, things in common between our two libraries, other than being both public libraries. These two «　sisters　» can not be compared. Not their buildings, nor their collections, nor their staff : I am alone at Mtein, 19 people work at Chaptal. However, both our libraries are open to all publics, from babies to adults, and their readers are mostly children and families. Both libraries wish to be attentive to young people and offer them specific areas and programmes. Both offer many programmes: storytelling, storytelling for babies, workshops, exhibitions, shows). Chaptal has a high quality multimedia offer. At Mtein, we only have PCs, and we look forward to organizing better computer workshops. How can we envisage our partnership? Soizik Jouin suggested that I help her make a list of books in Arabic, for the young readers of her library or other Paris libraries. The selection I made can help them make a better choice of Arab books. 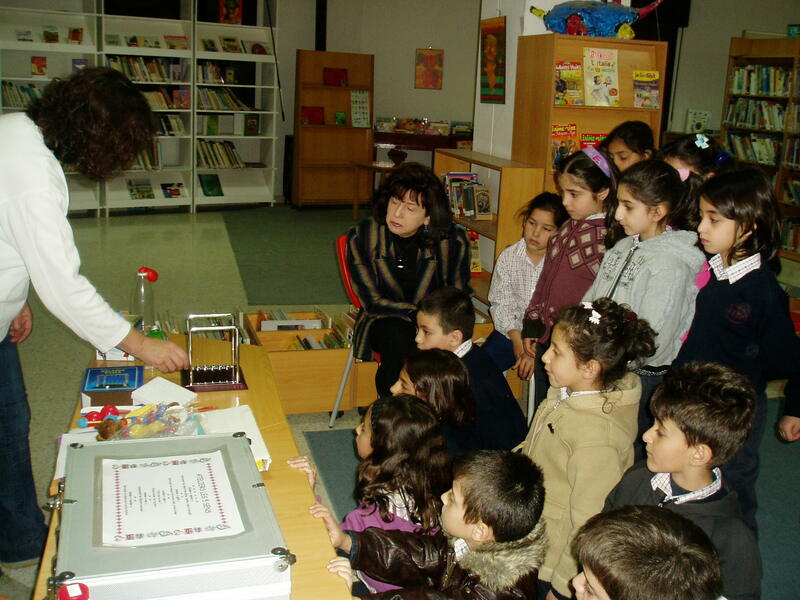 From April 2009 to April 2010, Lebanon was the «　World’s Book Capital　» and for the occasion, Mtein library and Bikfaya library built a common project, « Tut Tut 3a Beyrouth　» bringing readers from both libraries to Beyrouth, through literature and art, especially photography. «　Beyrouth capitale mondiale du livre　» accepted to fund part of the project: the purchase of books for the travelling exhibition «　Beyrouth seen by francophone authors　». The rest of the budget was funded by the municipalities : the photo exhibition «　Œil sur Beyrouth　and the visit of Lebanese authors to both our libraries. 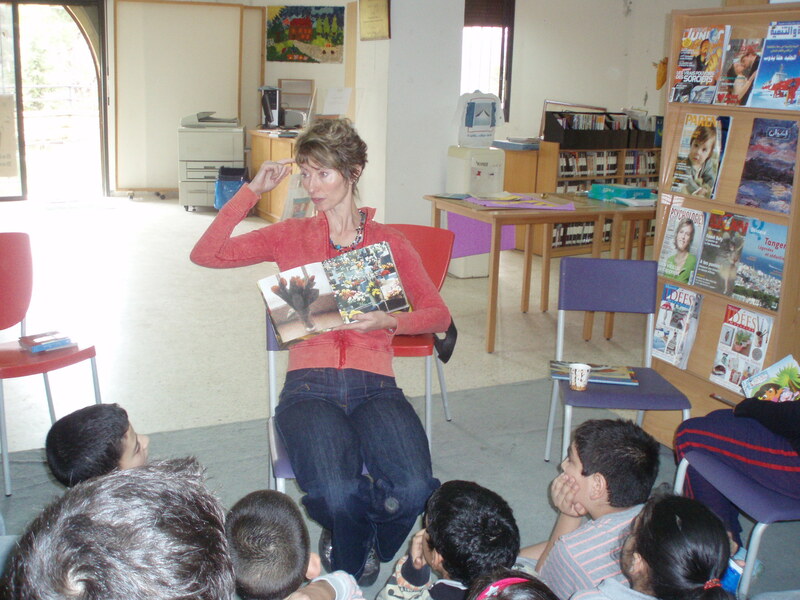 We needed to find a partner to fund Kochka’s trip, the author who wrote about Beyrouth in «　La fille aux cheveux courts　» and　« Le plus grand matin du monde　». Her visit was to close the programme. I took the liberty to ask the question to Soizik, hoping that the Parisian library would be able to help us, but our request came in too late to be included in Chaptal programme. 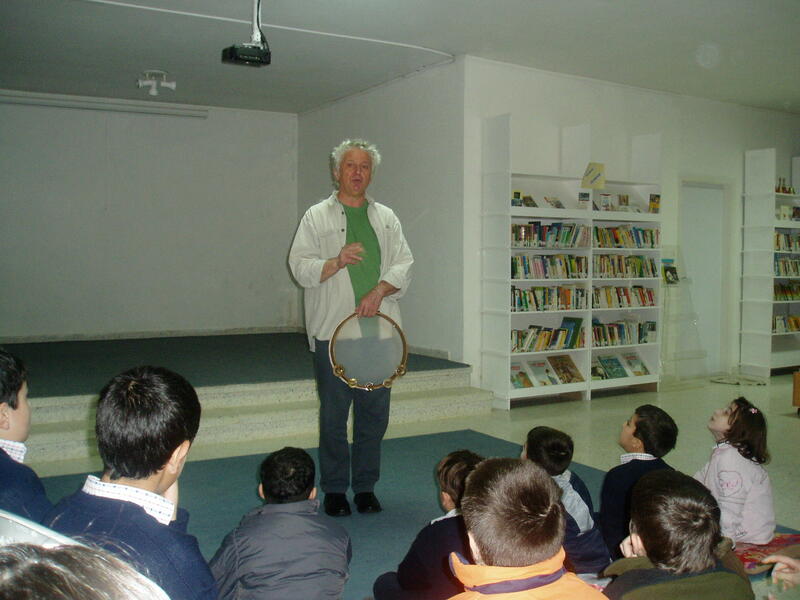 Luckily, our French partner (the French Cultural Centre in Beyrouth) supported us, and the author was able to meet several school classes a tour library. These were precious moments, thanks to Kochka’s sensitivity and her way of presenting her works. Later, Soizik suggested a project that would put our young readers in touch via internet. This was not possible because neither our library nor hers had the right tools. Maybe we should have organised a specific programme before suggesting this type of contact. 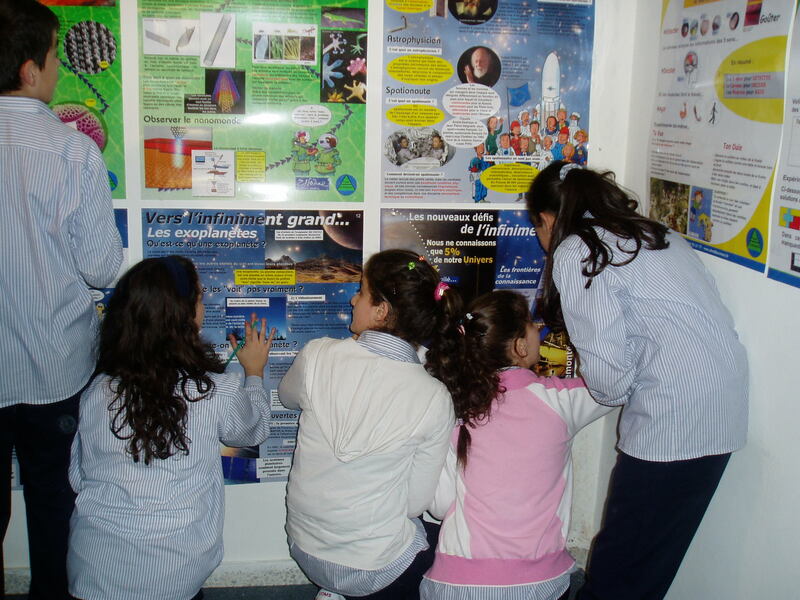 So we had the idea of an exhibition　: «　Lebanon seen by French children, France seen by Lebanese children　». With drawings, texts and activities about French writers who have written about their childhood in Lebanon, and Lebanese writers who have written on their childhood in France. This would enable our readers to dialogue via internet, or create a blog or a journal! Mtein library has recently obtained an internet connexion that would make this type of project possible. For 2012, we envisage exchanges of librarians or other professionals, for instance a multimedia specialist from France and an Arabic-speaker storyteller. We continue our discussions, hoping to achieve exchanges profitable to both partner libraries. Nous nous sommes inscrites dans le projet de bibliothèques partenaires, « Sister librairies » lancé en novembre 2009, afin de développer notre bibliothèque et de promouvoir la lecture dans notre pays. La coopération entre une petite bibliothèque et une des bibliothèques publiques de Paris ne peut être que valorisante pour nous et pour nos lecteurs enfants et adolescents. Nous échangeons depuis août 2009 des e-mails pour décrire les activités de nos deux bibliothèques et ceci après avoir fait la présentation de nos deux lieux de travail : majestueux pour Chaptal (l’hôtel de Sérigny, construit en 1780, a été complètement restauré et réhabilité) et bien modeste pour Mtein. L’idée d’être partenaire « la sœur» de Chaptal m’a beaucoup motivée car il n’y a pas, au premier regard, de points communs entre nos deux structures hormis celui d’être toutes deux des bibliothèques publiques. Nous ne pouvons pas mettre ces deux « sœurs » en comparaison. Ni au niveau de l’espace, ni au niveau de la collection, d’autant que nous n’avons pas la même capacité en personnel : A Mtein, je suis seule, 19 personnes travaillent à Chaptal. Pourtant, nos deux bibliothèques sont des établissements à dominante jeunesse et familiale ouvertes à tous les publics, du bébé à l’adulte. Les deux bibliothèques souhaitent être à l’écoute des adolescents et veulent leur donner dans les collections, les espaces et les animations une place spécifique. Toutes les deux proposent de nombreuses animations (heure du conte, heure du conte des bébés, ateliers, expositions, spectacles). Chaptal possède un pôle multimédia de qualité. A Mtein, nous n’avons que de simples postes et nous cherchons à améliorer notre atelier informatique. Par quel biais nous pouvons envisager notre partenariat ? Soizik Jouin m’a proposé de l’aider à faire une liste des livres arabes pour le jeune public arabophone de sa bibliothèque ou des autres bibliothèques de la Ville de Paris. La sélection que j’ai établie pourra les aider à faire un meilleur choix de livres arabes. Soizik Jouin m’a parlé des séances de « Goûters Philo » organisées dans sa bibliothèque et de l’accueil des classes : «Le 19 octobre, nous avons fêté là la bibliothèque Chaptal les dix ans de la collection de livres « Les Goûters Philo » qui veut initier les enfants à la philosophie avec 86 enfants de CM2. D’avril 2009 à avril 2010, le Liban vit à l’heure de « Beyrouth capitale mondiale du livre » et, à cette occasion, la bibliothèque de Mtein et la bibliothèque publique de Bikfaya ont construit un projet en commun sous le titre « Tut Tut 3a Beyrouth » qui veut amener les lecteurs des deux bibliothèques à Beyrouth à travers la littérature et les œuvres d’art, la photographie en particulier. La direction des projets de Beyrouth capitale mondiale du livre a accepté de financer une partie du projet : l’achat des livres concernant la valise-expo « Beyrouth vue par les auteurs francophones ». Une deuxième partie du budget a été couvert par les municipalités (exposition photo « Œil sur Beyrouth » et la prise en charges des visites d’auteurs libanais dans nos deux bibliothèques. Il nous restait à chercher des partenaires pour financer le voyage de Kochka, l’auteure qui a écrit sur Beyrouth dans deux titres « La fille aux cheveux courts » et « Le plus grand matin du monde ». Sa visite devrait clôturer les activités de notre projet. Je m’étais permis de poser la question à Soizik en espérant que la bibliothèque parisienne aurait les moyens de nous aider, mais ma demande est arrivée trop tard par rapport à la programmation de Chaptal. Heureusement notre partenaire français (le CCF de Beyrouth) nous a soutenus et l’auteure a rencontré plusieurs classes dans nos bibliothèques. La rencontre fut de très grande valeur, vu la sensibilité de Kochka et sa manière de présenter ses œuvres. Par la suite, Soizik m’a proposé un projet visant à mettre des enfants de nos bibliothèques en communication via internet, ce qui n’a pas été possible parce que nous n’avions pas les bons outils de communication d’un côté et de l’autre. Il aurait peut-être fallu faire une animation spécifique avant de proposer ce type de contact. Sur ce point nous avons lancé une idée d’une exposition « Le Liban vu par les enfants français et la France vu par les enfants libanais ». Avec des dessins, des textes et des animations autour des écrivains français qui ont parlé de leur enfance au Liban, ou des Libanais qui ont parlé de leur enfance en France. Cela nous permettrait de faire dialoguer via internet les lecteurs, de créer un blog ou un journal ! La bibliothèque de Mtein a récemment obtenu une connexion internet qui permettra la réalisation de ce type de projet. Pour l’année 2012, nous envisageons des échanges de bibliothécaires ou d’animateurs : par exemple un spécialiste de multimédia français contre une conteuse arabophone. Nous poursuivons la discussion dans l’espoir d’aboutir à un échange profitable pour les deux bibliothèques partenaires.